Edmonton was one of five Canadian cities to join a national call for a new program for migrants workers, particularly those in the caregiving industry. 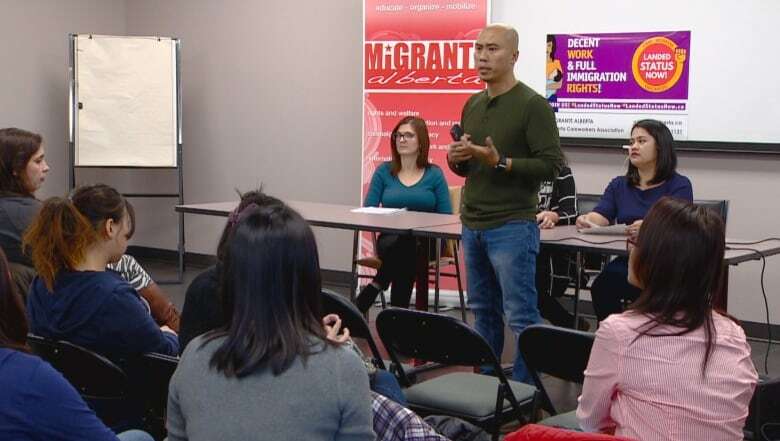 Edmonton was one of five Canadian cities to join a national call for a new program to protect migrants workers, particularly those in the care giving industry. A coalition of care workers is asking the federal government for a better deal when the current Caregiver Program expires in November 2019. The Care Worker Voices for Landed Status and Fairness report was released Sunday as the regional groups held news conferences in Edmonton, Vancouver, Toronto, Montreal and Ottawa. Marco Luciano, director of Migrante Alberta, said caregivers are living with uncertainty. "A lot of them are on the verge of losing their work permit and will fall into cracks," Luciano said. "Many of them will have to choose to either stay here or go back home." The report contains stories of about 150 care workers in Canada and aims to show the impact on migrant workers being separated from family, earning low wages, and having uncertain residency status. The report calls on the federal government to grant migrants workers permanent residential status upon arrival. It also suggests allowing immigrants permanent residency after one year instead of the current wait of two years. Luciano said employment conditions are questionable with many working beyond regular hours without taking a day off. "They are working and living in their employer's home," he said. "It's really hard for them to file a complaint against their boss, which only lives upstairs," he said. Many migrant care givers are accessible around the clock, he said, even though the standard work week under the labour code is 40 hours. "Thinking your status in Canada — your life in Canada — is tied to one employer, is really detrimental to the lives of migrant workers," said Luciano. The group says an average of 8,000 new care worker permits were issued each year in the last five years. Workers arrived on a temporary resident status without their families. Luciano says he is calling on the Canadian government to be "humanitarian" in addressing the issue of care workers.